Just yesterday I ran into a fellow writer at the airport (while waiting in line to get groped by the TSA) and we started talking about projects we were working on and stories we’d managed to get published. We got onto the subject of sending our books around and I mentioned Duotrope (which I just realized I haven’t done a write up on yet!) being good for short stories, but there really being nothing out there for longer pieces. “Oh, but there is!” she said. Query Tracker is a killer querying website that gives users the ability not only set up an agenting wishlist, but also to keep track of several queries at once (a la SubmissionMojo and Duotrope). The agent profiles are exceptional, as they include which genres they specialize in and a full listing of where you can find them on the web. They also host a vibrant forum for writers who are working on the query process, where support and positivity seem to be common threads of thought throughout. The website itself is quite simple to use and has free and (more advanced) paid-for options. These paid-for options, however, are awesome and, if you’re serious about getting agented, well worth the $25 yearly subscription fee as they open up a plethora of tools that make the site an absolute godsend if time is important to you. The image above is a list of what becomes available when you fork over the cash. One of my favorite things about Query Tracker is the Agent Wishlist you can create. 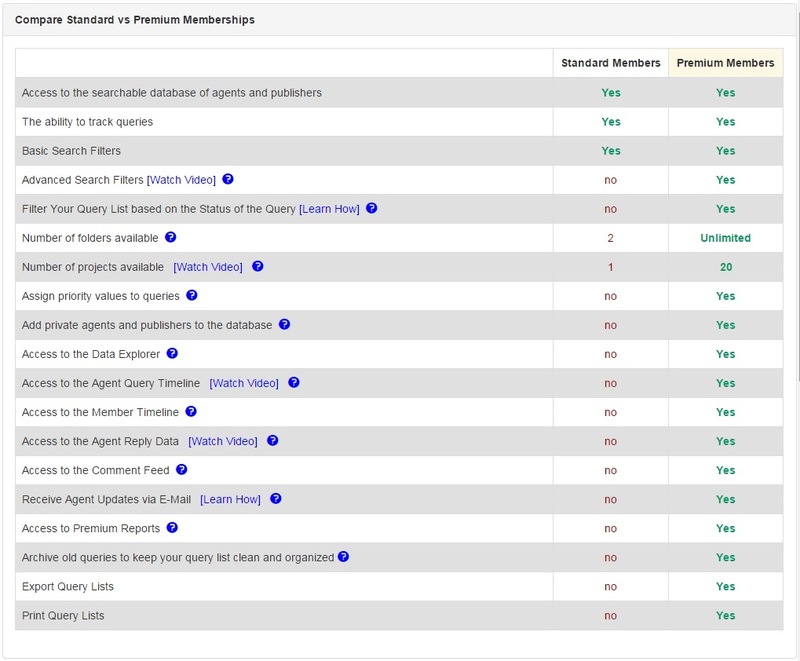 If there’s an agent you know of that you think would be perfect for your book, but they’re not accepting any queries at the moment, Query Tracker lets you add them to a list tied to your account, which then notifies you when their workload opens up and they’re open for submissions again! You can also use the wishlist to compare/contrast different agents, letting you bounce between their profiles with ease. When figuring out which agents are right for you, Query Tracker gives you the ability to narrow your searches based on a variety of factors – from genres they specialize in, to where they’re located, to their preferred methods of query. This saves a shitload of time and helps build the agent wishlist that much quicker. If you’ve been following my blog, you know by now that, without tools, I tend to not enjoy managing my projects with regards to where or to whom they’ve been sent. Query Tracker takes the headache out of keeping track of these kinds of things, giving you the ability to focus on your writing instead of your excel spreadsheets. As I said above, Query Tracker Premium costs $25 per year, which, when you think about it is only four drinks from Starbucks. But the time you save and the ease with which you’re able to navigate the site make the measly payment worth it in my books. Serendipity! I also just discovered Querytracker, and hope to sit down and really learn how to use it.